Apple products are always “The Best”,this is also true in case of Os (Snowleopard).The only reason it did not reach people as Microsoft beacuse of its cost and hardware requirements. Apple promises that the new OS X Snow Leopard will be faster than its predecessor, and better than Microsoft’s Windows 7. Bertrand Serlet, Apple’s senior vice-president of software engineering, told developers at the WWDC conference in San Francisco that Snow Leopard would be “faster, more responsive, and even more reliable than before”. Throughout the keynote, Apple poked fun at Microsoft, which is scheduled to launch its next-generation operating system, Windows 7, in October. “Microsoft dug quite a big hole for themselves with Vista,” said Serlet, referring to Microsoft’s most recent operating system, which was ill-received by users and tech experts alike. 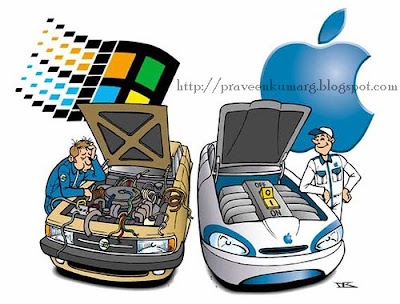 Regarding Windows 7, he said, uses the “same old technology” as Vista, while Apple came from “a different place”. What Snow Leopard Offers ? Snow Leopard places an emphasis on speed and efficiency, promising a faster install time and a smaller footprint, taking up 6GB less hard disk space than Apple’s current OS, Leopard. It will boast a faster web browser, in Safari 4, as well as the ability to prevent whole web pages crashing when plug-ins and videos fail to load. The new-look Expose tool will allow users to explore files and documents without first opening the associated program, while the new QuickTime software will enable users to edit and share videos from directly within QuickTime. “We’ve built on the success of Leopard and created an even better experience for our users, from installation to shutdown,” said Serlet. Snow Leopard will support Microsoft Exchange and build it straight in to programs such as iCal, Address Book and Mail. Apple said people will be able to upgrade from Leopard to Snow Leopard for $29. UK pricing details have not yet been confirmed. The software will be available in September. Mac is very costly everybody cannot afford it.